Recently I was given permission by two people I trust – my GP and my therapist – to stop everything and rest until I feel better. No matter how long it takes. — Don’t they understand I have things to do? Can’t they see my giant to do list? And on and on…. Obviously we teach what we need to learn. Over and over again. No matter how long it takes. So I wanted to offer that same permission to you. To rest until you feel better. No matter how long it takes. 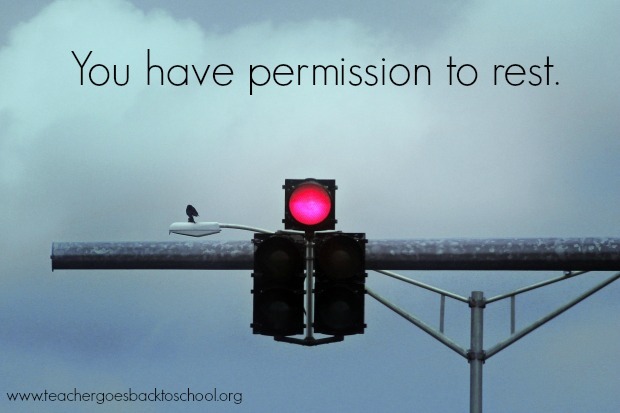 Because you might need it – the permission and the rest. Wishing you a peace-filled and restful week. PS – if someone you know is having a hard time and would benefit from rest, please forward this message to them. This entry was posted in A Yoga Story, Life as a Mama, Life At Home + The Neighborhood, Self-Care, Tiny Tips Tuesday and tagged burn out, grief, illness, permission, permission to rest, self-care matters by Teacher Goes Back to School. Bookmark the permalink.